For the countless fishermen who ply the Great Lakes in search of trout, salmon, steelhead and walleye, the times they are a changing. Ultra clear water, scattered pockets of game fish and a declining population of forage fish are forcing anglers to adopt new fishing methods and more mobile fishing strategies. The Phantom 222 and 202 Off Shore models pictured here represent a whole new generation of open water fishing boats for Smoker Craft Marine. Clear water and transient fish are forcing anglers to be more mobile. The traditional fiberglass Great Lakes boat that sits in one port from April to September may soon be a distant memory. These days anglers are opting for smaller — but still seaworthy boats — that are better able to be trailered from port to port and stay on the hottest fishing action. Perhaps the most unique of these fishing boats fall into a category I’ll dub the “Generation Next” series of welded hull fishing boats because these craft are dramatically different than any other aluminum fishing platform ever built. 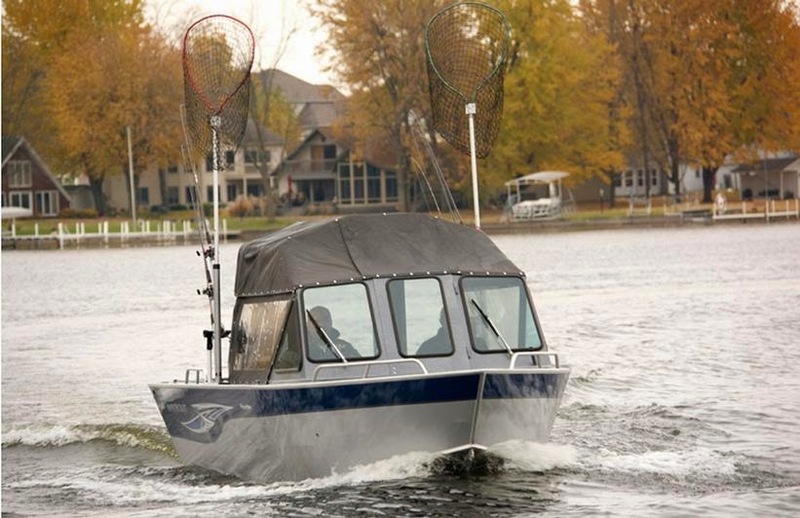 In the Great Lakes region, Smoker Craft Marine has developed the American Angler series designed to fill this niche in the aluminum fishing boat market. Made up of dozens of models, the Phantom 222 Off Shore, 202 Off Shore, 202 and 182 models are the flag ships in this new open water fishing platform. To start with the American Angler series of boats feature welded hulls built from thick plates of aluminum vs the thin aluminum skins and other fixtures of the boat are made from material thicker and tougher than traditional boats use on their hulls! Secondly, this class of boat features a steep dead rise hull design designed to literally eat up rough water and beg for more. The Off Shore designation of these boats also feature set-back engine mounting plates that aid the boat in rough water performance, allow these rather large and heavy boats to come on plane quickly and also to deliver more fishing room in the cockpit of the boat. Built for big water the 17 degree dead rise on the Phantom series delivers a hull that can run rough water and yet be fast out of the hole and capable of impressive top end speeds even with modest outboard power. These boats feature a whopping hull thickness of .190 with the side decks featuring .125 making them built more like battle ships than fishing boats. Another obvious similarity these boats share is a “helm forward” design that puts the steering wheel and windshield further forward than traditional boats. This design opens up the back of the boat for more trolling room and provides room for a canvas enclosure that allows the occupants a dry ride regardless of the weather. The helm forward design of the Phantom series of fishing boats readily accepts a canvas enclosure that provides the occupants a comfortable and dry environment regardless of the weather. Other great features include welded fish boxes, flat gunwales to accept rod holders and downriggers, flat topped consoles designed to accept sonar, GPS and marine compasses, diamond plate accents and flow thru drainage systems that allow waves to crash into the boat and then to drain right back out strategically located scupper holes. Built more like battle ships than fishing boats, all the boats in this new American Angler series of Great Lakes fishing vessels are functional, no nonsense open water fishing machines. The ultimate in low maintenance boat designs, the floors are aluminum covered in vinyl that can be easily sprayed off and scrubbed down to keep everything ship shape. Rod storage in the form of overhead rocket launchers are a common sight. Dry storage inside the boats consists of sealed welded boxes that simply don’t allow a drop of water to get inside. 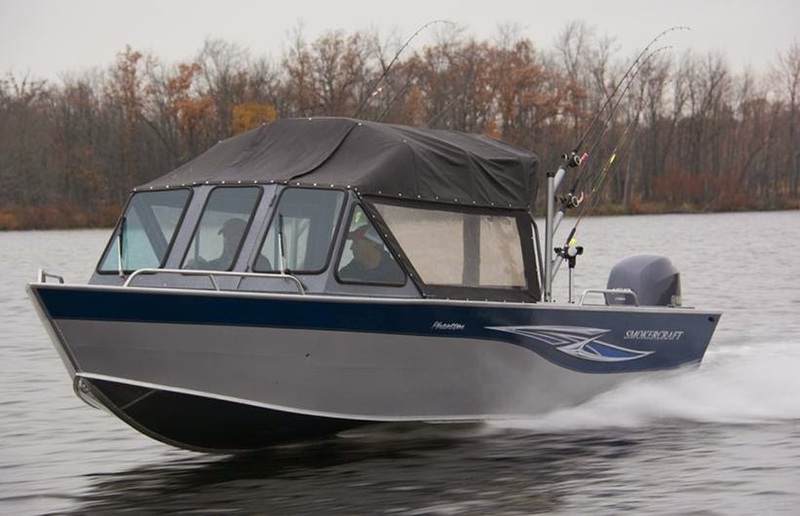 Designed to function with outboards in the 115 to 225 hp range, collectively the “Generation Next” of open water fishing boats are unique and functional in many ways. It’s easy to see why more and more anglers are turning their back on the traditional Great Lakes boats in favor of these lean, mean fishing machines. No one can predict what changes will occur in the Great Lakes sport fishing scene moving forward, but with the help of these new boat designs getting to the fish and back home safe isn’t going to be an issue. 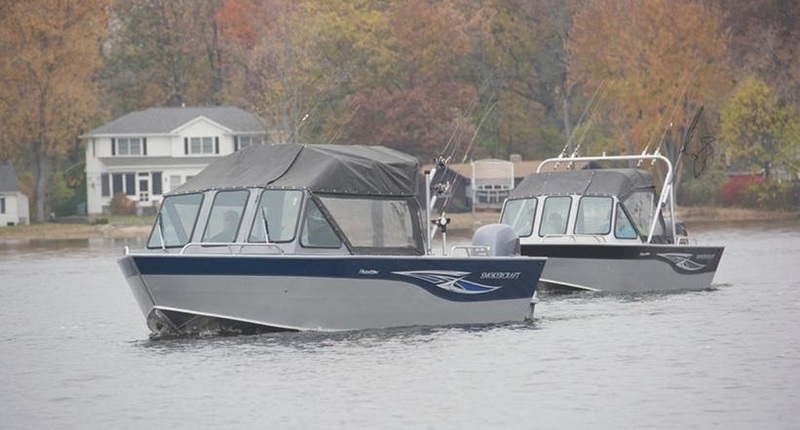 To learn more about this unique class of fishing boats visit www.americananglerboats.com and be sure to check out the test ride videos.